Snack Girl would love a breakfast spread that has no artificial colors or preservatives and has 50 hazelnuts per jar that makes my morning easier. Wow! What could this magnificent stuff be? Nutella, of course. Made with cocoa, hazelnuts, and LOVE. Your children are going to go bananas for this stuff. sugar, palm oil, hazelnuts, cocoa, skim milk, reduced minerals whey (milk), lecithin as emulsifier (soy), vanillin: an artificial flavor. SUGAR! SUGAR! SUGAR! is the first ingredient. The breakfast that Nutella advocates (a glass of skim milk, orange juice, and Nutella on whole wheat bread) has a whopping 10 teaspoons of sugar per serving. Try spooning 10 teaspoons of sugar in your mouth and see how your day goes. Or maybe you should just serve your child a Coke for breakfast. 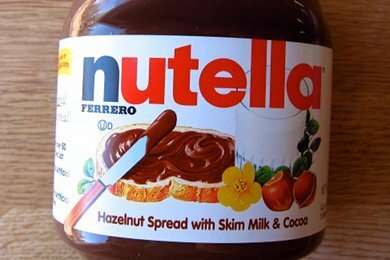 A mom in California is actually suing the maker of Nutella for deceptive advertising see here: NPR Article. I'm planning on suing Nutella because of the unrealistic depiction of a mother at breakfast time. Where is the ponytail? Why is your shirt so clean? And, why are those children so silent? Ummm, yeah, so Snack Girl happens to love Nutella, but not for breakfast. It is a treat! With its 21 grams of sugar per 2 tablespoons, I use this stuff rarely. How does Nutella compare to America's favorite spread, peanut butter? The best peanut butter has just 3 grams of sugar for 2 tablespoons. So, you are adding more than SIX times the sugar by using Nutella. So let's say you bought Nutella, your kids love it, and now after reading this you are a bit upset. Do I have a solution for you! Frankly, I don't even want to mention this product because it is so addictive, but I am going to share. Peanuts, evaporated cane juice, cocoa, cocoa butter, palm fruit oil, vanilla, lecithin (from sunflowers), salt. So, now you are adding a teaspoon of sugar to your breakfast (compared to plain peanut butter) and now you should lose the juice and add some strawberries and I think you are doing pretty great! What do you think of the Nutella ad? Have you tried "Peanut Butter & Co."? Natural Jif: What's The Dif? I absolutely LOVE PB& Co and I think it tastes even better than Nutella by a LONG shot. I really love your posts and truth about food. It's so misleading what marketing does. My daughter loves Nutella and is allergic to peanuts. Sigh. Insert sad face here. @Neil :( - could you mix maple syrup into almond butter? OR - mix almond butter into nutella to cut the sugar? I'm just thinking out loud here. I love nutella, but started using chocolate Peanut butter, It is hard to find in my area, I may have to order it on line. Or better yet make our own. Just gotta find a good recipe. Justin's Nut Butter makes a Chocolate Hazelnut Butter that is divine. Hazelnuts are the first ingredient, and it has 7 g of sugar per serving. I just whipped up a batch of Almond Butter and Nutella cookies. So I guess according to the commercial they would make a great breakfast... ;) I think for a spread I'd rather use plain peanut butter. I prefer Nutella to the peanut butter chocolate but do not buy Nutella.....too much sugar! I found this recipe recently, but have yet to make it.....soon I hope! in case someone wants to make it, it sure sounds easy in the food processor! @Neil: Sunflower seed butter? It has more of the creaminess of peanut butter that almond butter lacks. And I LOVE PB&Co. Dark Chocolate Dreams! One (SMALL) spoonful is the perfect craving quencher! What about just adding some good quality cocoa powder to (any kind) of nut butter? Not sweet enough? Maybe pair it with fruit or just a little bit of honey? Peanut butter has a lot of fat in it though. It's all about moderation. One tablespoon of Nutella isn't going to kill your day. A little sugar and some carbs for breakfast pared with some protein, (eggs, turkey sausage etc.) is going to give you the full you need. Now I'm not saying eat the whole jar for breakfast but I don't think a little will hurt you. thank u for the info!! Can't believe how much sugar Nutella has.....10 tsp? Who needs 10 tsp of sugar at breakfast? I LOVE Nutella as a treat too, but, never for breakfast. I am more of a savory person. Actually though 4.2 g = 1 teaspoon so 2 Tbsp has only 5 teaspoons of sugar, not 10. (side note). I agree with you on the mom in the commercials - so funny! PB&Co ~ LOVE it as a treat too but prefer natural nut butters without anything in them. I love PB & Co! Maple, White Chocolate, and Cinnamon Raisin Swirl are delicious. Also, look for them at the Christmas Tree Shop or Ocean State Job Lot in New England for so much cheaper! I've gotten them for 2.99 at both places. Christmas Tree tends to cycle food products out, but I found them a few weeks ago after not seeing them for a while, so I guess they're back for now! At the Super Target stores in MN (those with a grocery section), you can find PB&Co.for less than $4 a jar. Most locations sell the dark chocolate, white chocolate, and cinnamon raisin flavors. Target's "Market Pantry" line sells an all natural PB that is just peanuts & salt. Just 1 gram of sugar and it costs about $2 a jar. You should check out "Better N Peanut Butter". 2 tbsp = 2 pts. They also have a chocolate peanut butter (not my favorite). The plain peanut butter is fabulous with cut up fruit. Try is.